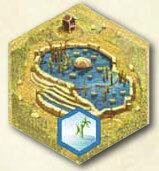 Place the special "pond tile" at the center of the playing surface. 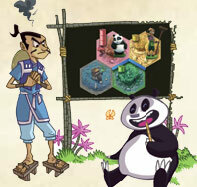 Place the gardener and the panda figurines on this plot. Mix the remaining Land Plot tiles to form a draw pile, face down. Lay irrigation channels and improvements (sorted by type) next to this draw pile as reserve. Set the "Emperor" card aside and sort the remaining cards by category (plot, gardener, panda) and shuffle them to form three draw piles, face down. Each player receives his individual board, 2 action chips and one card of each category (each player makes sure to keep his cards hidden). Warning: weather comes into play during the second round of play. In the first round, players ignore this step and proceed directly to the next. 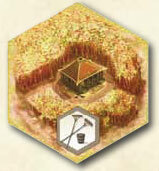 The player rolls the Weather Die and applies the effect of the climatic conditions obtained. Great sun shines on the bamboo garden. The player gains an additional action. This action must be different from their two regular actions. A fine rain nourishes the young bamboo shoots. 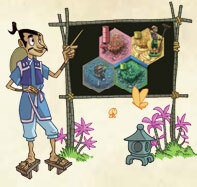 The player may place a Bamboo section on the irrigated plot of his choice, up to a limit of four sections per plot. A refreshing breeze blows through the bamboo garden. 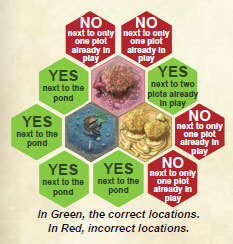 The player may, but is not required to, take two identical actions in this round (instead of two different actions). The sky rumbles and lightning strikes, frightening the panda. 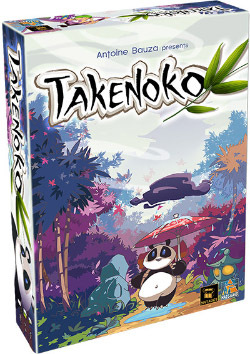 The player can put the panda on the plot of his choice. To recover from his fear, the shy animal eats a section of bamboo. Gray clouds darken the sky. Never mind, it is time to go on and perform some handy work. 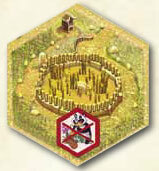 The player chooses an Improvement chip from those available in the reserve. It can then be placed immediately on a plot or stored on his individual Board. If no Improvement is available, the player applies the effect of another climatic condition of his choice (sun, rain, wind or storm). If he gets the "?" face, the player chooses what conditions they wish to apply this turn: Sun, Rain, Wind, Storm or Clouds. The player has two actions to take which must be chosen from among five options. NOTE: these actions must be different from one another. To finalize their choices, the player puts two chips on the appropriate spaces of their individual Board. The order in which the actions are resolved is chosen by the player. Then the player passes the weather die to the player on his left. The player draws three plots, chooses one and places the other two back on top of the deck, facedown in the order of his choice. The plot is adjacent to the special "pond tile". The plot is adjacent to two plots already in play. 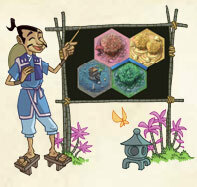 Each plot can grow one and only one bamboo shoot of its color. Note: the plots next to the special pond and those with the watershed improvement are automatically irrigated! A bamboo section is immediately added. Regardless of color, some plots have built-in Improvements. The player takes an irrigation channel from the reserve. Irrigation can be put into play immediately or stored for subsequent rounds. 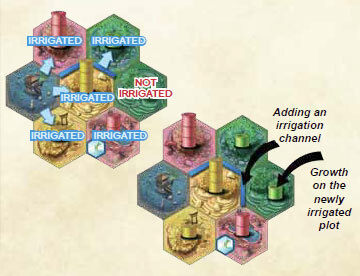 If a player has an irrigation channel in his reserve, it can be used at any time during his turn; this does not count as an action. Irrigations are placed on the border of two plots and form a network that always starts from a corner of the special "pond tile". It is adjacent to the special "pond tile", in which case the irrigation is automatic. At least one of its six edges hosts an irrigation channel. It has a watershed improvement. When a plot is irrigated for the first time, a section of bamboo of its color is added. A plot is eligible for this first shoot only once. If an irrigation channel irrigates two plots simultaneously, a section of bamboo is added to each. 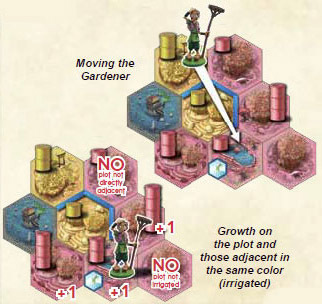 The player moves the gardener in a straight line, any number of plots in the direction of his choice. The gardener is only allowed to move over plots, not empty spaces between plots. He grows a section of bamboo on the plot where he finishes his move as well as on all directly adjacent plots of the same color. If a plot has bamboo at a height of four sections, then no section is added, because 4 sections is the maximum size of a bamboo shoot. Remember: Sections only grow in irrigated plots, even if the gardener finishes his move on the plot or on an adjacent plot. 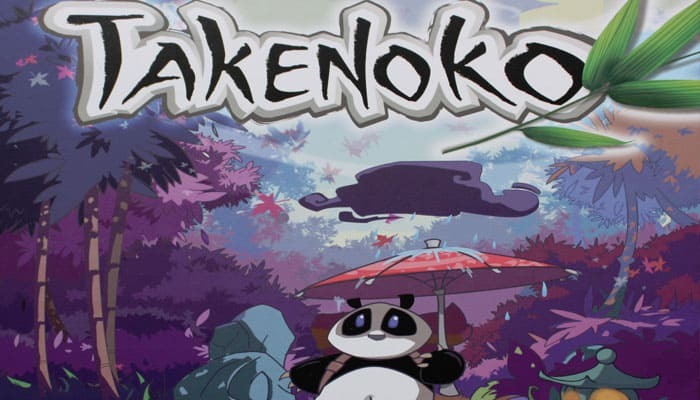 The player moves the panda in a straight line, any number of plots in the direction of his choice. 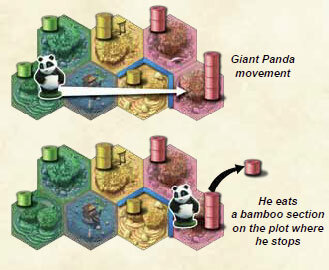 The panda is only allowed to move over plots, not empty spaces between plots. The panda eats a bamboo section from the plot where he finishes his movement. 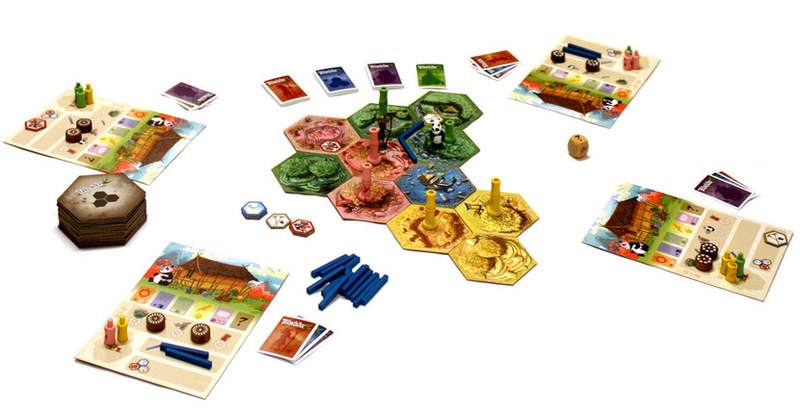 The player keeps this Bamboo section on his individual board. It can be used to fulfill a Giant panda objective. The player draws an objective card of the category of their choosing and adds it to his hand. Reminder: a player can only have a maximum of 5 cards. If a player has five cards in his hand he can not draw a sixth one. He must complete at least one objective before drawing again. Completing objectives does not count as an action. At any time during his turn, a player may complete an objective if the conditions shown on the card are met. To complete an objective, the player places the card face up in front of him. It is possible to complete several objectives during the same turn. Important: a completed objective is never lost, even if conditions on the board change. It is sufficient that the conditions shown on the card were met at the time when the objective was completed. These cards represent three or four adjacent plots. 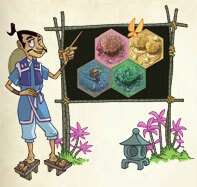 To fulfill this objective, the configuration shown on the card must be reflected in the bamboo garden. Important: To be valid the combination must be entirely composed of irrigated plots. a group of several bamboo shoot of three sections without any improvement constraints. These cards represent 2 or 3 bamboo sections. 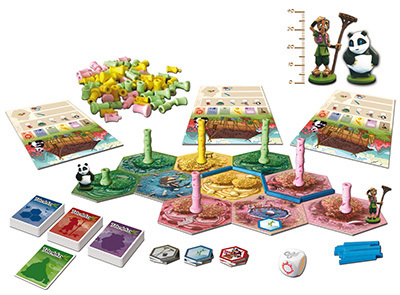 To fulfill this objective, the player must have the required sections on his individual board. These sections must be put back into the reserve after the objective is completed. The improvements can be built into a plot (in which case they are printed on the plot) or can be added if a player has acquired an improvement chip thanks to the "Clouds" weather condition. If a player has an improvement in his reserve, it can be used at any time during his turn; this does not count as an action. Improvements can only be added to plots where bamboo has not yet grown (this means plots which were just placed, plots which are not irrigated, and plots where the Panda has just eaten everything). Each plot can have one and only one Improvement (whether built-in or added), and it is not possible to change it later. The enclosure protects the bamboo in its plot. The panda can move across or stop there, but cannot eat any bamboo there. Fertilizer increases the growth of bamboo on its plot. Each time the bamboo grows, two sections are added instead of one (subject to the usual 4 sections maximum). The watershed provides the bamboo in its plot all the water it needs. Therefore this plot does not need to be irrigated and automatically benefits from the addition of first growth related to irrigation. Warning: a watershed cannot under any circumstances be used as the beginning of a new irrigation system. 2 players: when a player completes his ninth objective, it triggers the last round. 3 players: when a player completes his eighth objective, it triggers the last round. 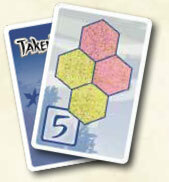 4 players: when a player completes his seventh objective it triggers the last round. The player who started the final round takes the Special 'Emperor' card (worth 2 points) and finishes his turn. 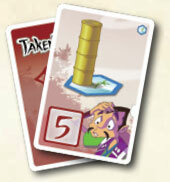 Note: A player may still complete other objectives during the turn in which he triggers the final round. Each player totals the points indicated on their objectives completed during the game. Any cards still in hand have no value. The player with the highest score wins the game and receives the congratulations of the Emperor. 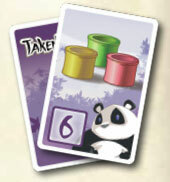 In case of a tie, the player with the most points on the Panda objective cards wins.